Will Enterprises Get Hooked on Wearables? Wearable tech is not just the latest buzz that’s happening around the Apple Watch or Google Glass. The wearable tech market is growing rapidly across numerous industries from healthcare to retail. One area where it’s becoming a strong contender is in the business world. As enterprises begin to realize the improved performance and success possible by bringing in wearable devices, spending on initiatives for wearables in the workplace is also increasing. New research from Salesforce shows more and more adopters are looking to incorporate wearables into the everyday workflow of business to help improve productivity and connectivity with employees and customers. The new report, "Putting Wearables to Work: Insights on Wearable Technology in Business," also found that much like mobile devices have made their way into the business world, so too will wearable tech devices. They will follow similar paths in regard to developing specific apps catered to user needs and implementing BYOW (bring your own wearable) policies. In fact, 54 percent of companies said they already have a BYOW policy in place and another 40 percent said they are planning to implement one in the future. "Wearables are the next phase of the mobile revolution. Like smartphones before them, the key to success for wearables in the enterprise is all about the killer business apps," said Lindsey Irvine, Global Director of Strategic Partnerships, Salesforce. "This research demonstrates the tremendous opportunity for wearable use cases to drive significant business value." What stands to be a giant game-changer for businesses will be the data collected from wearable devices and what they do with that data since it provides actionable insight in real-time. More work is still needed in this area however. Only eight percent of those who responded said they are totally ready to gain the actionable insights from the data both employee and customer wearables will provide. But a future where wearables are common place for the enterprise is inevitable. Seventy-nine percent of adopters said wearables, “are or will be strategic to their company's future success” with 86 percent saying they plan to increase spending over the next 12 months. The quickest to climb in popularity once the enterprise wearable tech space gets into gear, will be smartwatches - followed by digital lanyards and smart glasses. All of these wearables can be used by employees who work remotely and on-the-go for easy access to vital information about customers and products and services. 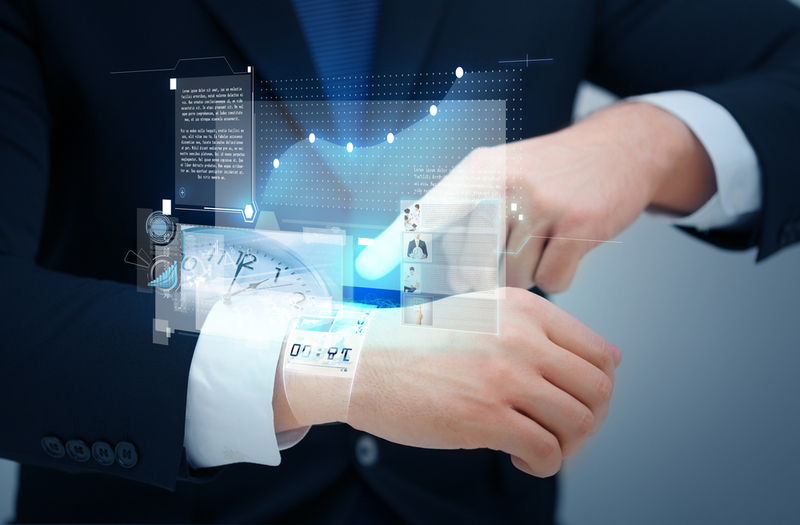 Wearables for the enterprise will be a key discussion at the upcoming Wearable Tech Expo. Topics will highlight the use of augmented reality in the enterprise and how in conjunction with business apps, employees, customers and a business’ bottom line all stand to benefit.